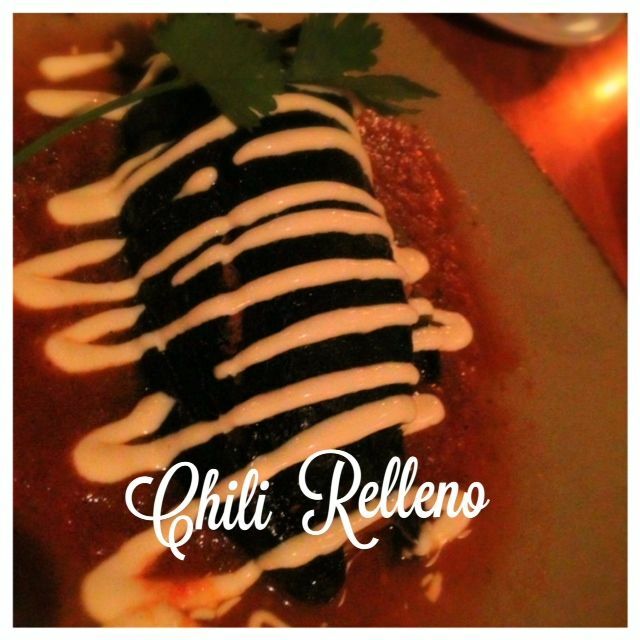 The tasty Chili Relleno from Nuestra Cocina. We have lived in the Portland area for years and our friends that have been here for 1 year discovered this place on their own before us. They were so excited that we had not been yet, so they invited us to enjoy it with them. This is another one of those places where you leave asking yourself, why had we not been here yet? The waits are long. As I understand, they are long every night of the week. I do appreciate that they let you head to the bar and order drinks while you wait for your table. I ordered the Serrano Lime Drop. It had a good amount of spice that got you almost immediately, then the tart of the lime, from your typical lime drop, was what settled on your tongue. I loved this drink as it was the perfect combination. We grabbed our drinks and headed outside to a table and waited for about 45 minutes. Our friends told us we needed to order lots of small plates. Even though there were a few main dishes that looked good, we all thought this was the best way to go. We just started pointing and ordering. Even if they plates are small, I would rather taste more things to get a feel for what they have to offer. Each meal starts out with corn tortillas with salsa. 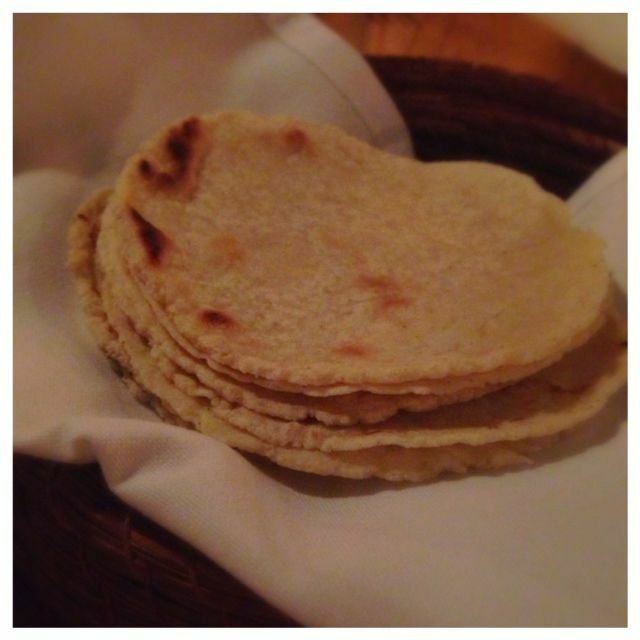 I just love how house made corn tortillas are thicker and have tons more flavor than anything you can buy at a store. They were great dipped in the salsa. I’m pretty sure we went through a few baskets as we waited for our food, because so they were so good. I always love to try Enchiladas, so this one got my vote as the one I wanted to try. 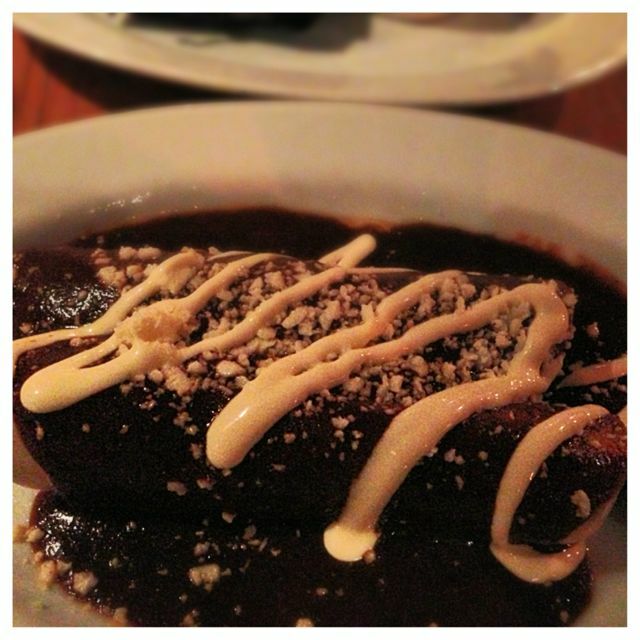 It was a Chicken enchilada with a red chile mole, crema & cotija cheese, and it came with 2 enchiladas. I won’t lie I was a little nervous the mole sauce because some mole sauces can be so strong in cinnamon that I don’t like them. Not this one! It had great bold flavor and it was stuffed with tender juicy chicken. I was bummed I had to share it. 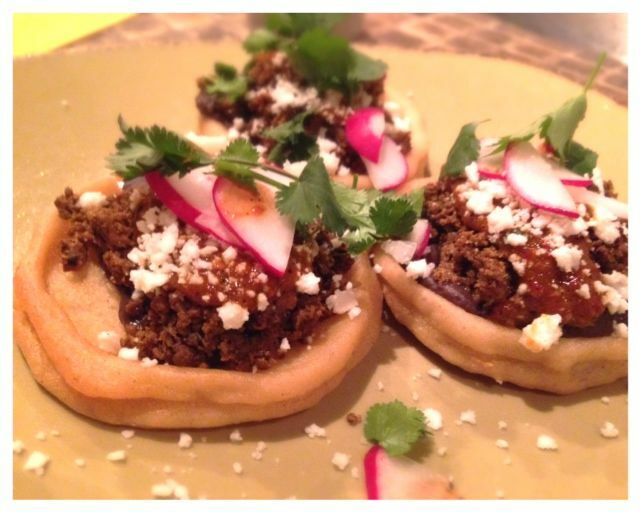 Sopes, which are crisp masa cakes filled with chorizo, black beans and chile, were our favorites. I loved the heavy texture of the masa cake, which made a great base, since it was loaded with tons of chorizo, beans and slight kick of the chili. We fought over who got the ones with the most radish because the spicy radishes added a whole other level of spice to each bite. We all felt like it was the one dish that was really filling. The couple we came with already knew this was their favorite. Once we had a taste, we loved it just as much as they did and we knew we needed to order a second round. So we did! 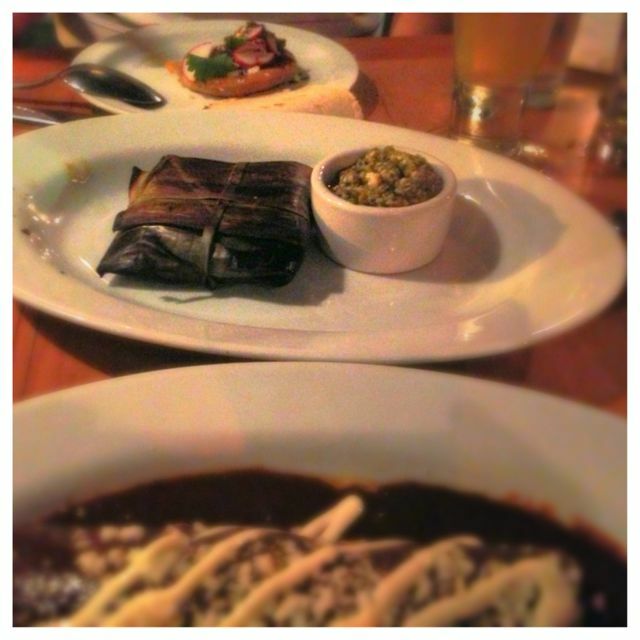 We were excited to try the Chili Relleno, which is a Roasted Poblano stuffed with shredded pork, almonds & raisins. When Poblanos are roasted they become sweet, mix that with savory pork and you have a perfectly flavored dish. Also I think the presentation on this was pretty great too. This next one is such a big name we just called it the Grilled Spanish goat cheese in banana leaves & pumpkin seed salsa. I really does come out wrapped in this banana leaf. You unwrap it and dig in. I loved this because it was so different. We used the house made corn tortillas for this dish too. I have never had anything like this at a Mexican food restaurant, so I’m glad we tried it. We even had to ask how to eat it, because we just weren’t sure. You add the cheese and the pumpkin seed salsa to a corn tortilla and enjoy. I loved the taste and mostly the texture of the pumpkin seed salsa. Again, something I had never had before and completely enjoyed. Like I said before, the pics are not the best, but the food and service and whole experience was top notch and I want you to know about this place. I’m sure the locals don’t want me to tell you about it though. We still can’t believe we had never been. We plan to go back for sure and take our friends, since it was their idea to begin with. Update: We made it back, ordered our favorites, plus a few other new things. Here’s just a few more photos. I loved that we got to sit at the chefs table tonight. They talked to us the whole time and helped us order. As our food came up they just handed it to us. Everything was hot, fresh and fast. Our server did a fabulous job as well! Love these Sopas. Had to order them again and I suggest you do too. 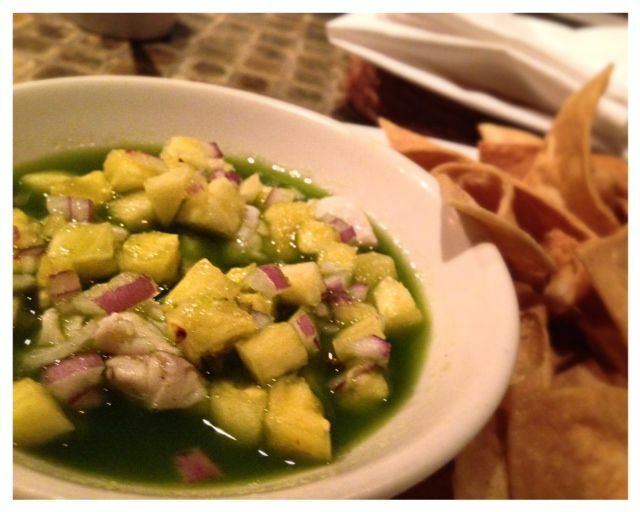 Ceviche with Rockfish. Special of the night and spectacular. Have you been before? What’s your favorite thing to order here? Atmosphere was cozy, yet bustling. It’s not a big place, but they do have places for you to gather as you wait. Or at least they did during the summer. 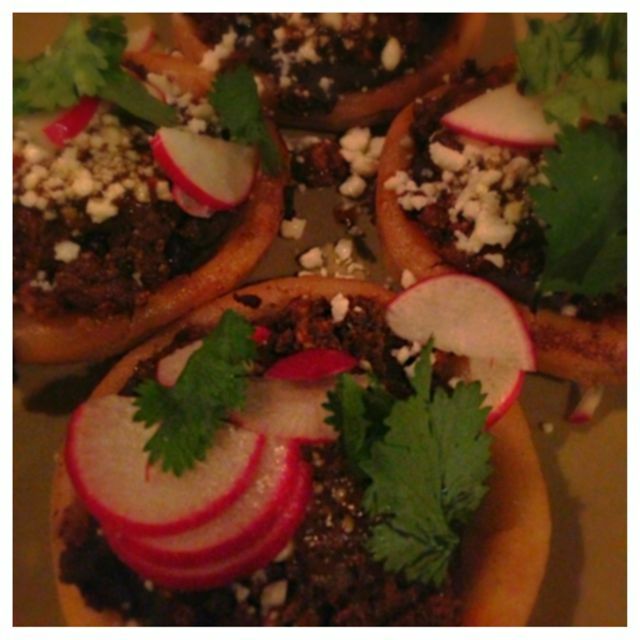 Pricing is around $8 for small plates and $18 for large plates. Service was great. This place was hopping, but our guy was on top of it the whole time. They had great cocktails and some pretty decent beers. Nuestra Cocina is located on Division Street. They have a large back room as well so there is more seating. This is one of my favorites in Portland. I’ve never had a bad meal there!